I can’t even tell you how excited I am to introduce you to today’s guest poster. 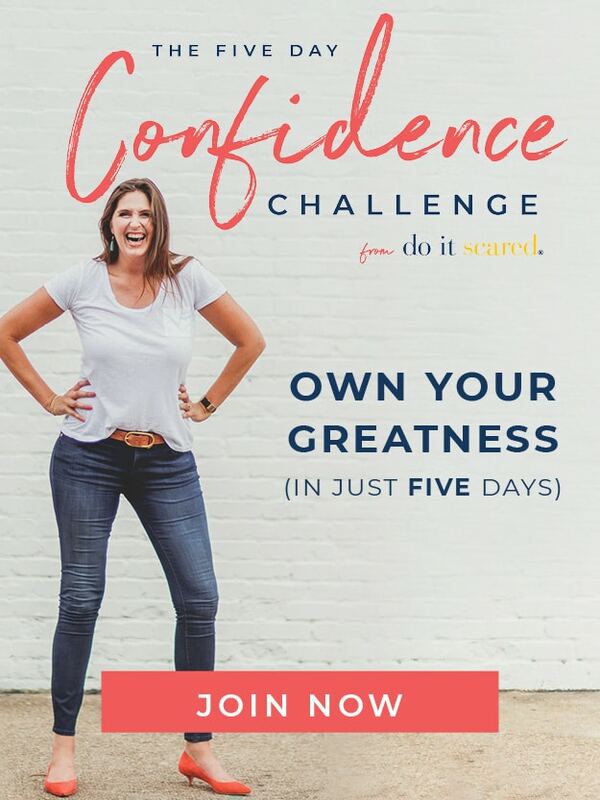 If you have been following this blog for a while, you know what a huge fan I am of Ashley Ann Campbell and her awesome blog Under the Sycamore. 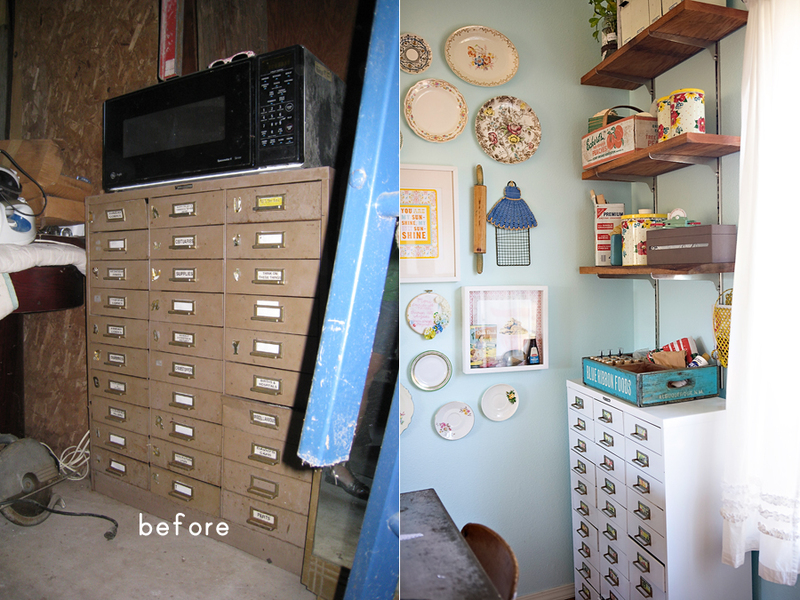 Ashley is one of those amazing people that can literally make everything–even junk–look good. 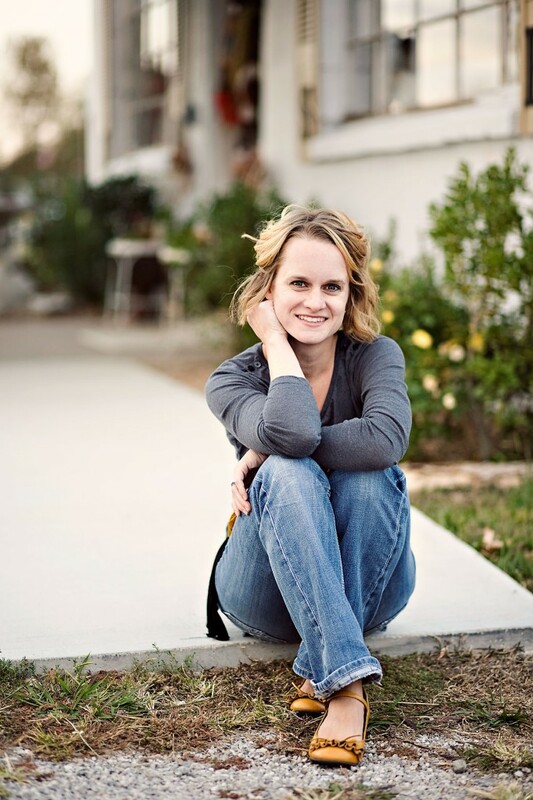 Her photos are stunning and her craft projects are so cute, original, and doable, it is no wonder they have been featured in national magazines. Her incredibly original and eclectic style is something I can only dream of attaining. What I love best about Ashley, though, is that her priorities are always in the right place. Her kids come first every single time, and she inspires me daily to be a better mom. I am not an interior designer nor do I know the first thing about technical design rules, but I do love visiting homes that reflect the owner. I spend most of my time at home with my four kids so it is important to me that our rooms are reflective of my family. With four young kids running through the house with swords and light sabers I have no desire to decorate with expensive items that I’d be constantly fretting over if they were in the path of destruction. I want my home to be comfortable, beautiful and a haven for my family. My personal style is a bit more eclectic vintage than most, but decorating in the style you love does not have to mean making a big financial investment. So here are 5 of my favorite tips for creating a home that you can love without a price tag you hate. Flea markets, estate sales, & garage sales can be a gold mine–as long as you are willing to see the potential, not just what is right in front of you. While rummaging through a very dirty barn I came across an old metal cabinet. Knowing I needed something to store my craft supplies in I asked the owner what he would take for it. He viewed it as broken & dirty….I viewed it as beautiful potential. He sold it to me for $5.00. After some work I ended up with a practical and beautiful piece of furniture that fits my style. The more you learn your personal style, the more you will be able to see potential in items others toss aside. Blogs and websites are great resources for finding inspiration on how others do this. 2. Paint is your best friend. Whether it is spray paint, porch paint, craft paint or wall paint – nothing can provide an instant makeover and facelift like paint. In our bedroom we needed to remove the carpet for allergy reasons, but were not at a point to make the financial investment in hardwoods. For a temporary solution I used porch paint and a stencil I created on my floors. It gave my room a very personal touch for very little money. I like it enough that I’ll probably put off getting those hardwoods installed for a lot longer. I’ve also recently began spray painting all the brass hinges in my home to a dark bronze. The investment is minimal, but it is an instant update in my home. 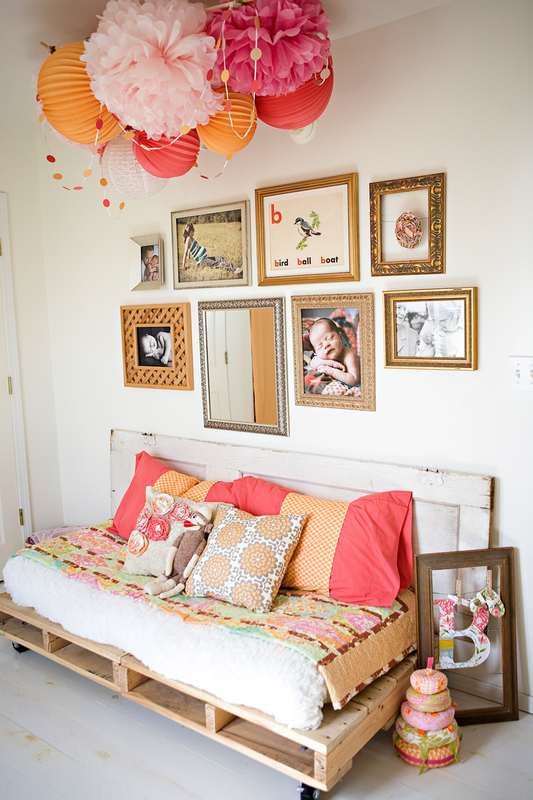 For my daughter’s bedroom I wanted to fill the walls with various frames, but a collection of large frames can quickly become expensive. I’m not naturally drawn to the color gold, but gold & silver were the main colors I found in the sale and damaged goods. I began gathering frames of similar colors and style. Initially I thought I’d paint them all a bright color, but once I saw them laid out next to eachother I really liked the eclectic look of them. This rule can be applied to other collections too. I have done the same with turquoise glass jars and globes. 4. Sheets are a great source of fabric. I know how to sew a basic straight line, I would never call myself a seamstress. However, I can sew a curtain and in my quest to find fabric for curtains I am always surprised at the price of beautiful fabric. In an effort to save money I often use discount sheets (like the Walmart brand) for my curtains. Adding some trim or a band of cute fabric turns them into great curtains. I also use sheets for outdoor tablecloths and large pillows. Even with a 50% off coupon at most craft and fabric stores the fabric is typically still more expensive than a sheet. 5. Never underestimate the power of a hot glue gun. My hot glue gun is one of my very favorite tools. You can use a hot glue gun for all kinds of projects including home decorating. I tend to hot glue things to my walls a lot. If you use semi-gloss or glossy paint, you can put a dab of glue on your item, let it cool a little, then place on the wall. Very rarely does it pull off the paint when you remove it. However, gluing items to your wall is not for everyone. You can use a glue gun to create artwork, add traction to the bottom of a rug and even fix a curtain (not that I have ever hot glued a curtain 🙂 ). In the photo below I printed 4×6 pictures, trimmed them to 4×4 and glued them to the wall. 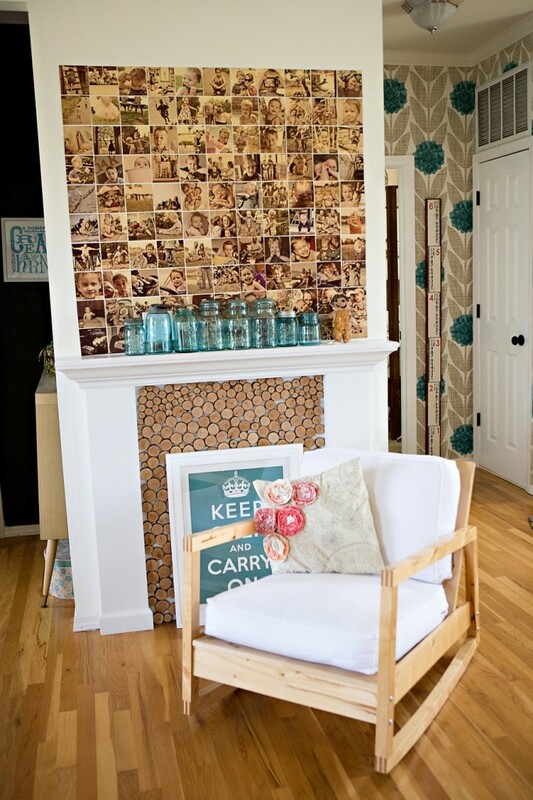 If you aren’t comfortable gluing to your wall you could create a frame out of scrap wood and a sheet…then glue your photos to the sheet. 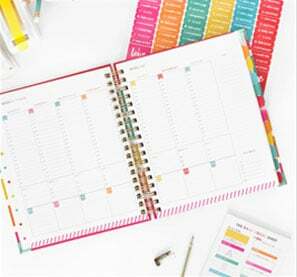 Well I hope those tips get your creative ideas flowing on ways you can create a home you love on a budget that makes you smile too. Thanks for having me Ruth! Fabulous tips! I think it all boils down to creativity in the end…when you do find gems in thrift stores or garage sales, it challenges your creativity as to where and how it will be used or placed in your home. Also, many times, you really don’t have to buy anything — all you need is a paintbrush, or rearrange furniture! I never thought of sheets as sources of fabric, and now I can’t think why. Great ideas!! Thanks, and I will be checking out this website for sure!! 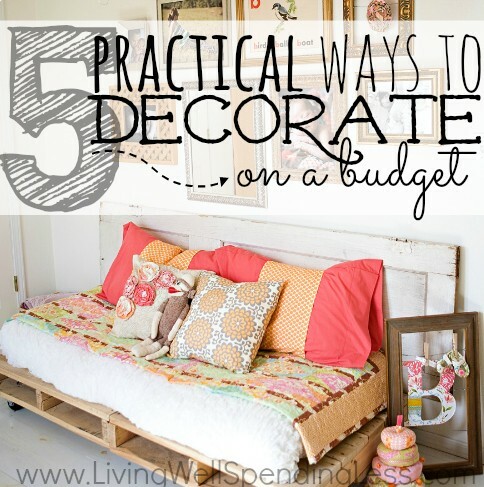 You are providing some really great tips on how decorate or re-decorate a home on a budget. It does not take that much of money or efforts to make a room get a new look. sometimes even just to re-arrange some furnishings, exchange of some decor and accents or like you said, painting the walls can make all the difference in the world. About decor and accents is like about everything else that you can buy – you just should compare some prices and you can make some good finds for just a few dollars even in retail or online stores. I just visited your blog. The tips mentioned to decorate the house on a budget are outstanding . 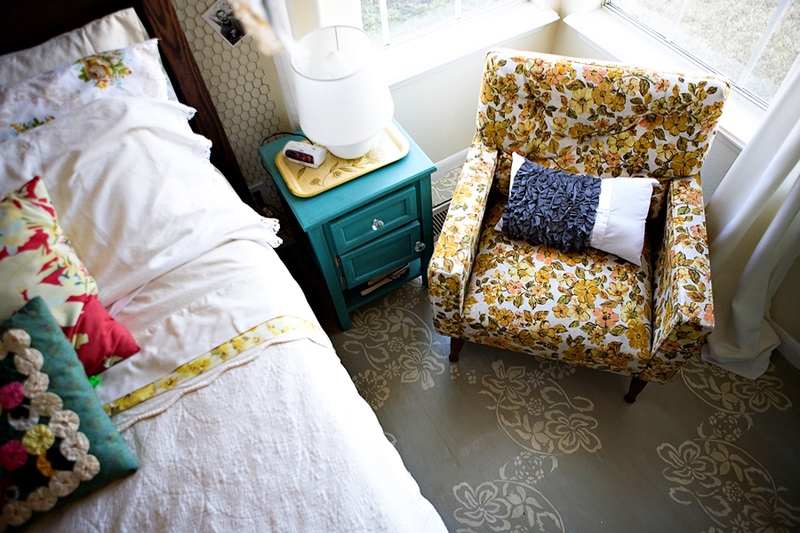 I like how Ashley painted the floor with porch paint and stencil. Very creative! 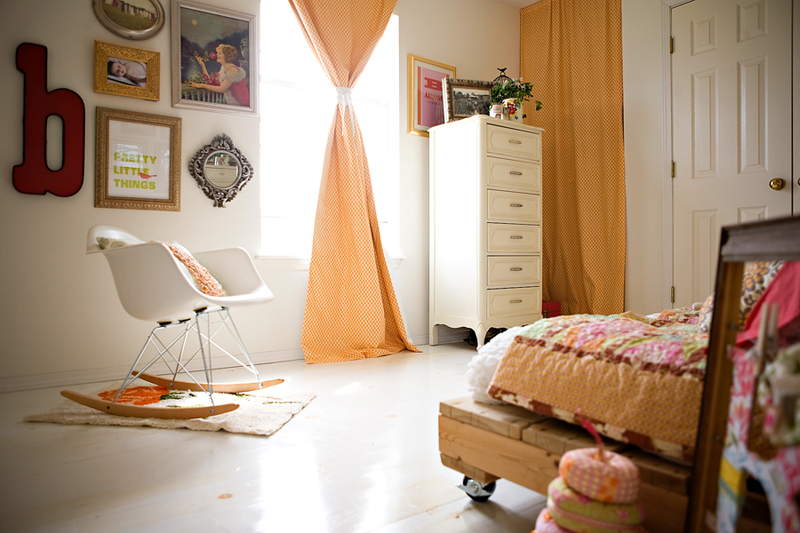 Love these tips, especially about using a bedsheet for curtains. I’m in need of some color in my apartment and this is the perfect, inexpensive solution! Can you please tell me how you did this bed?? I LOVE it, where did you find all the materials to make it?? will always be a viable trend in the art world. This allows for specific categorization of the content of the site making it easier to find what you’re looking for. go to any extreme to make you buy the art pieces. Wow. Now this is a fantastic article. As a young wife in training, this will come in huge help to me when I start decorating my own house. I love repurposing things! Your talent is way ahead of graduate designers its innate and blessed. Awesome ideas. I will try to follow ur strategies, until done pray for me to succeed.